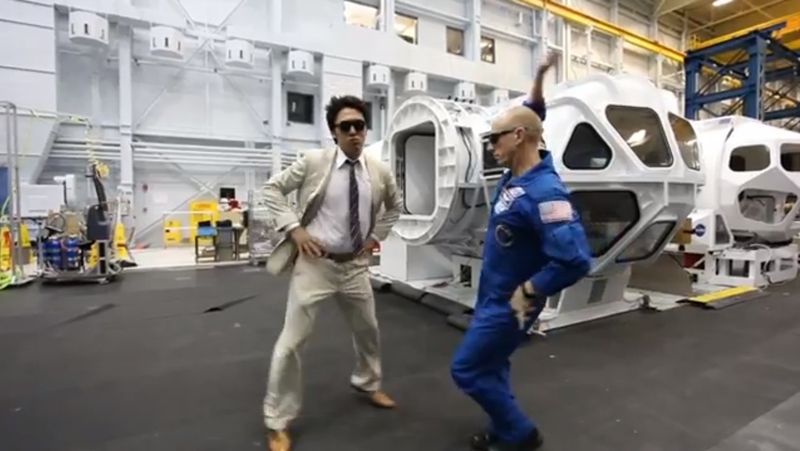 A NASA intern impersonating PSY dances with ISS Expedition 15 astronaut Clayton Anderson (Credits: NASA). In a month that has brought bruising criticism of NASA’s plans, strategy, and focus, the agency released a music video that proves it’s still able to hit the ball out of the park on occasion. The video, called “NASA Johnson Style,” is a parody of the PSY phenomenon “Gangnam Style.” The Korean rapper’s video went viral in August, spawning any number of spin-offs and spoofs – but none of them feature dancing astronauts. Featuring real life astronauts Mike Massimino, Clayton Anderson, and Tracy Caldwell Dyson.